Imagine you’re a high school senior struggling with the hefty amount of competition that comes with applying to colleges. What do you do? You apply to many schools. Heck, back in 2012, I think I applied to at least 10. But have you ever thought about how much you’ll spend on applications alone? We all know about the high costs of earning a degree, but just applying to college can have a scary price tag. 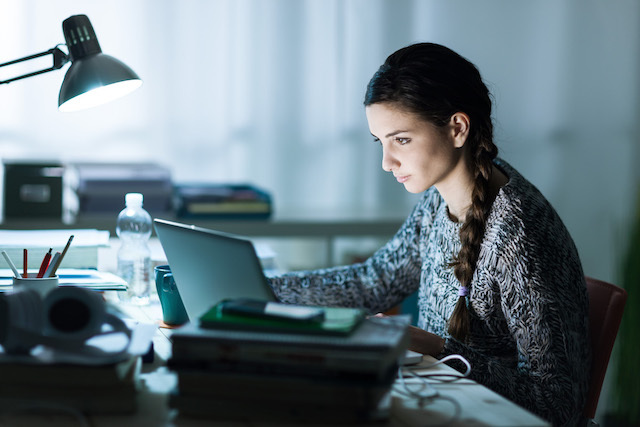 You should know what you’re getting yourself into — before you start applying left and right to any school where you think you have a shot at being accepted. U.S. News & World Report recently released a report about the costs of applying to colleges — and it wasn’t pretty. Application fees for spring 2016 averaged $42; the most common fee was $50. The most expensive? Stanford University and the University of Central Oklahoma, which each charged $90. Just to apply. And no, you don’t get those fees back if you get rejected. Back in the day, my dream school was Villanova University; if I applied there today, it would cost me 80 bucks. Based on these numbers, I would have to shell out anywhere between $420 and $800 to apply to 10 colleges today. With that in mind, it may seem like application fees will get in the way of you and your dream school. But fear not — there are ways you can lower the financial burden of applying to schools. Students can apply for a fee waiver from the National Association for College Admission Counseling by simply logging on to its website and accessing the form. Just download and print it, have it signed and sealed by your high school, and send it directly to the postsecondary institution you wish to apply to. You received an ACT or SAT testing fee waiver. You participate in the Federal Free or Reduced Price Lunch Program. Your family’s annual income falls within these income eligibility guidelines set by the U.S. Department of Agriculture’s Food and Nutrition Service. You are enrolled in a federal, state or local program that grants aid to low-income families. You live in federally subsidized public housing or a foster home, or you are homeless. Applicants can use this fee waiver to apply to no more than four schools. Additionally, only students who seek to go straight to college after graduation are eligible; you can’t receive a waiver after a gap year or if you plan to defer college enrollment after graduating from high school. There are actually quite a few colleges out there that don’t require you to pay anything to apply. Niche compiled a list of the 2017 Best Colleges with No Application Fee in America. The website weighed factors such as academics, value, professors, student life and student surveys about their overall experience to develop the list of 100 colleges. Notable schools on the list include Marquette University, Loyola University Chicago and Case Western Reserve University. If you have the ability to head to a few of the colleges you have in mind, it might be a good idea to do so. According to NerdWallet, some schools are willing to drop application fees for students who visit campus and take a tour. In addition to potentially getting an application fee waived, a visit could change your mind about the school altogether. Wouldn’t you rather know a school you had in mind just isn’t for you before you apply? You could save not only money, but also time, by avoiding an unnecessary application. If you run into dead ends with these ideas, have you thought about getting a side gig? There are actually plenty of opportunities for incoming or current college students to make a few bucks online. The best part is, you can usually do these gigs on your own time, meaning you won’t fall behind with your school work. If you can, hold on to these gigs for as long as possible — having an income during school can majorly offset your costs, keeping you from racking up student loan debt. Your Turn: How will you offset the costs of college applications this year? Let us know in the comments below! Kelly Smith is a junior writer and engagement specialist at The Penny Hoarder and a senior at The University of Tampa. She thought she wanted to be a Florida Gator until she visited campus and realized that The Swamp is, indeed, a swamp.